When looking for a gift for your parent or older spouse, consider their five senses as inspiration—sight, smell, taste, touch, and sound. Whether you want to bring them comfort or assist them with one of their fading senses, this can be a creative way to shop for their next gift. 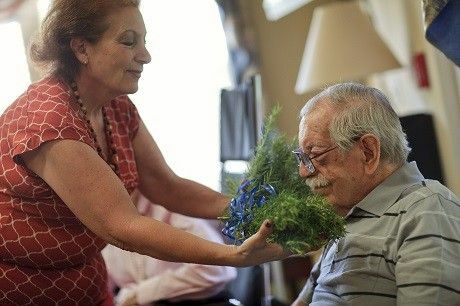 If your loved one has dementia and may no longer be communicating, a gift for the senses can break through that limitation. Use your creativity to find a unique gift that will please one of their senses. Whatever you are giving as a gift, try to make the gift wrapping as precious as the present that you have thoughtfully selected. Use lovely wrapping paper, brightly colored ribbon, colorful tissue paper, silk flowers to adorn a gift, and a beautiful gift card. A beautifully dressed gift box shows that you have taken the time to make something special for them. The gift can be a treat for the eyes before the present is even opened. Giving them a gift of images from the past is a wonderful way to spark memories. A scrapbook, framed photographs, or photo album of past holidays or family gatherings is another thoughtful gift to reminisce and share stories. These captured moments can transport them to another place in time. If their eyesight is fading, gifts to assist them are appreciated. A clock with large type that displays both the time and date, a phone that shows photos of who they frequently call, or a large button universal remote for the television can help make everyday activities easier. If your parent has dementia, a digital clock that shows the day of the week along with the time of day (morning, afternoon, evening, or night) can help those who might be confused. Directly hard-wired in our brains is the sense of smell. When we smell an odor or fragrance, this is transmitted to your olfactory bulb which is in the part of the brain responsible for memory and emotion. That’s why the scent of fresh baked cookies can transport you back to your grandmother’s kitchen, or the scent of a dentist drill might make you recoil. A scent can instantly recall a memory and subconsciously trigger an emotion which can make a perfect gift. Give your mother a bottle of the fragrance that she wore when you were a child or aftershave that your father wore as a young man to evoke the feeling of nostalgia. Your mom might enjoy a scented lotion, floral bath gel, lavender sachet, or potpourri that reminds her of her flower garden or scented soap-on-a-rope for dad. A bundle of fresh, fragrant flowers can fill your parent’s apartment with days of cheer. Even the smell of fresh potting soil in a houseplant can remind them of digging in their garden. A fragrant gift can be more than a beautiful scent but can trigger pleasant memories. Who doesn’t appreciate a sweet treat? If you are looking for a fun gift to indulge their sweet tooth, prepare a gift of assorted treats to taste and compare. Purchase a gift basket of assorted cookies or an assortment of light, dark, and white chocolates with a variety of textures and fillings with a notecard to write down and track their favorites. They will enjoy comparing and savoring every bite! If they don’t like sweets, perhaps a sampling of different flavored teas, coffee blends, cheeses, or a variety of breads with olive oil. Take a favorite family recipe that has been passed down to you and bake or cook a dish that they haven’t had in years, but know that they will love. A tasting of treats is a great way to savor an afternoon together. For the gift of touch, think of items that are warm, cozy, or fuzzy. A softly textured blanket of faux fur can bring great comfort and warmth to your loved one. A warm scarf, fuzzy non-skid slippers, wooly sweater, soft sweatshirt, or a fluffy robe are appreciated by the elderly who often are cold due to poor circulation and a slower metabolism. If your spouse is suffering from the painful effects of arthritis, a comforting manicure may be an appreciated gift. Or spend the afternoon together at a day spa or one of our Aegis Living beauty salons to pamper their feet with a pedicure. These indulgent and healthy treatments are excellent ways to soothe their feet and hands with warm water, a gentle massage, or beautifully painted nails. Many seniors, especially those who have lost a loved one, miss that companionship and holding hands together. A massage is a comforting sense of touch gift that can not only comfort, but also benefit their circulation, decrease muscle stiffness, and joint inflammation. Make sure the spa that you choose understands how to massage an elderly person–often their skin is thinner and can tear so the pressure should be gentler and those with mobility issues may need to be positioned correctly. When looking for a location to take your parent, search for a spa that specializes in geriatric massage, or speak with your community’s General Manager to schedule use of our Aegis Living spa services. Music is a comfort to many that transcends age. Consider compiling a mix of their favorite artists or music from their youth, include meaningful songs like the waltz of their wedding dance or music that you sang to on road trips. Purchase a basic MP3 player with large buttons, such as the Sansa Shaker or this simple music player from the Alzheimer’s storethat is easy to operate. You can download music for free from Old Time Radio with favorites such as Frank Sinatra, Bing Cosby, Bob Hope and more. As you shop for gifts for a loved one, consider their five senses to inspire the perfect gift for their next birthday, holiday, or special surprise.